I’m going to let you in on a little secret. There are moments when I’m filled with doubt. Actually, there have been hours and sometimes days when I’ve been filled with doubt. I doubt whether or not I’m helping with my clients. I doubt my abilities as a parent. I doubt myself right now as I write this blog. Yet, here I am, still writing this blog (despite the doubt) and posting it and putting it out in the world. Did I feel nervous about it? Yes. Did I do it anyway? Yes – unless for some reason we’re in the upside down world and you’ve managed to read this in an alternate universe. When I feel doubt, I acknowledge the feeling. I check in to see if my doubt is something I need to listen to, because it’s important to listen to our doubt when it could cause us harm. 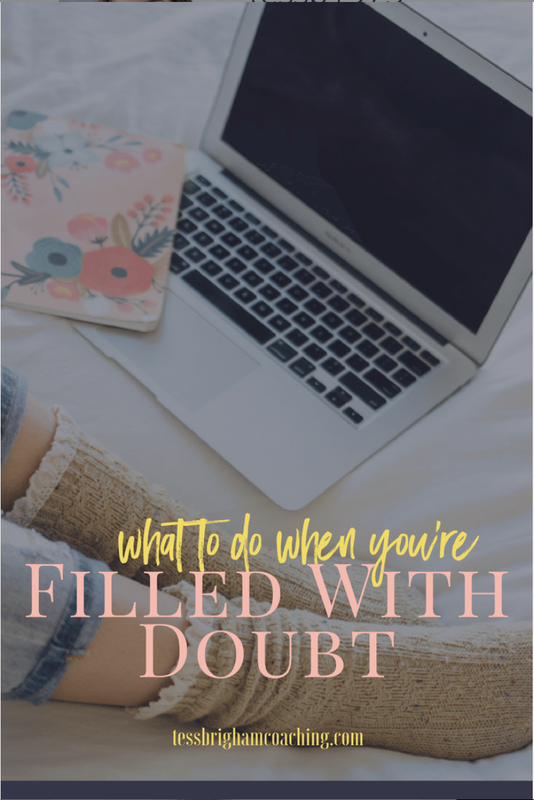 If I’m in the clear (which happens more often than not, especially when it comes to blogging– not the most dangerous activity), I just keep on going and push through all those doubtful feelings. Am I a superhero? Do I have special powers? No! I just know a few things I want to share with you about doubt. We’ve all seen that woman. She strolls down the street with such confidence and grace. She glides through the air as if she’s living on a different planet. A planet you certainly don’t feel like you belong on. You think to yourself, “She really knows herself. She is so sure of who she is and what she wants.” Maybe. In that one moment when you glanced over – maybe. All the time? That, well... that, I doubt. We don’t doubt our abilities when it comes to things we don’t care about. We doubt and question ourselves when we’re trying to do something that’s really important. Think about it this way: what’s the opposite of love? It’s not hate. Hate fills you with strong emotions and makes you think and do things you never would dream of doing. The opposite of love is indifference. If you love something or someone and they hurt you, you’re not filled with indifference, you’re filled with anger, and sadness, and pain. If you didn’t care about that promotion, or if you didn’t care about your career, or if you didn’t care about your relationship, well, then you wouldn’t feel doubt- you’d feel pretty much nothing. It’s OK to care if you’re going to knock that presentation out of the park because you know what you need to do: you’re going to have to work really, really, really hard on that presentation, and that’s a good thing. Now that you know your doubt is a friend and not an enemy, you can use this feeling to your advantage. When those feelings start to surface, you know you’re working towards or moving towards something or someone who is very important to you. This can either prompt you to push yourself harder, i.e. refine the presentation and make sure you have killer slides, or the doubt can make you feel lost and spin out of control. My father has been a trial attorney for over 45 years and I remember watching him a couple of years ago preparing for a case. He was working on his opening statement. He would practice and then go back and edit and then practice again. I watched him do this over and over again. My father is confident in his work but it’s that slight feeling of doubt or that small tinge of “keep tweaking, you can make it better” that helps him walk into a courtroom and know he’s put his heart and soul into his case. Doubt can fuel you, so use it to your advantage. Even on my best days I can find myself trapped in the doubt cycle. I’ll think to myself, “Should I call this person? Maybe email is better, or maybe I’ll wait until next week so I don’t bother them.” Or, “I shouldn’t write about that, no one will care.” Basically I’m going in circles trying to figure out which direction to move in, and in the meantime I’m not getting anything accomplished. The worst part of doubt is that it keeps you stuck. When you’re stuck, you’re not accomplishing anything. When you’re not accomplishing anything, you feel like a failure, which in turn fuels your doubt. It’s a vicious circle and there is a tool I love that works for me every time. Here’s an example from my life on how I use the 5 Second Rule. When my alarm used to goes off in the morning, I would hit the snooze 2, 3 and sometimes even 4 times (I’m not proud of this) until I absolutely had to get up so I could get my kid to school on time. “Hey”, I thought, “I work for myself. Shouldn’t I have the luxury of sleeping as late as I want? Sure, I feel rushed and hurried in the morning but I get my son to school on time and I’m not harming anyone. Right?” Yes, and no. This is why the 5 Second Rule has been a game changer for me, and why I want you to use it every time you start to doubt yourself. Our doubts live in the moment right when the alarm goes off and your hand starts to move towards the snooze button. That’s the moment that can literally change your entire day. When that alarm buzzer goes off in the morning, I’m the sleepiest person in the universe. I think to myself, “There’s no way I can get out of bed and face the day.” But then I say, “5, 4, 3, 2, 1” and I get up. Once I’m up and I move around, you know what happens- I’m awake, I’m not sleepy at all and I’m so happy because I’m working towards my goals. The next time you get a case of the “doubts”, I want you to use the 5 Second Rule and see what happens. If you’re doubting if you should ask for a raise, just say, “5, 4, 3, 2, 1” and schedule that meeting. Don’t think, just get up and start moving. Get a FREE copy of the Dealing With Doubt Affirmation Cards - tiny reminders that show you how to harness your doubt and make it work for you, instead of letting it stress you out. Success! Now check your email to get your cards. Your Intuition Is There For A Reason!